This Cork Board is an Enclosed Bulletin Board Framed in Oak Wood with a Locking Shatter Resistent Door! 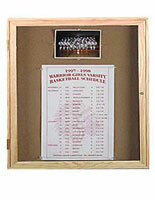 This Cork Board is One of Thousands of Notice Board Displays that Ship Quickly! 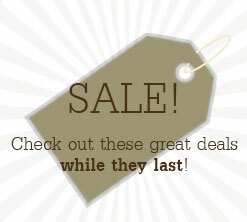 This tack board is the ideal cork board for years of use with its self healing surface. Tacks, staples and push pins all stick to this board with comfort. 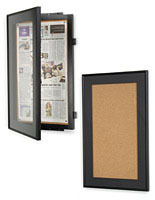 This bulletin board, cork board has four corner mounting holes located on the rear of the display for the mounting hardware of these option (hardware not included). 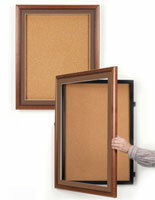 To install, merely purchase the correct mounting hardware for the wall you desire to put this outstanding cork board on, and hang it up! This case is designed for indoor use only. 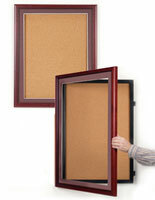 Bulletin boards, cork boards appearance outstanding in offices and school hallways. This cork board has a locking door. 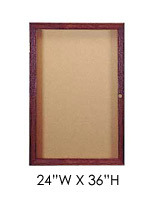 Announcement boards, tack boards, and other cork boards use shatter resistant acrylic doors to warrant your case's contents won't be tampered with. This tack board incorporates an oak frame. 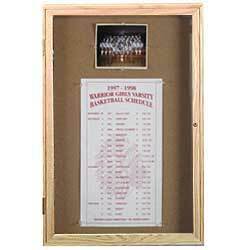 The beautifully crafted oak frame on this cork board, likewise recognized as a display board, will give your office lobby or student union an high end appearance. 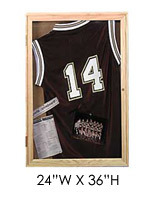 Displays2go partners with Ghent to bring you this deluxe, US produced cork board display. Ghent is a superior producer and marketer of American made visual communication products and specialty furniture, since 1976. 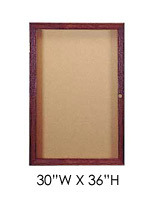 Case: 30" x 36" x 2-1/4"